Vincent R. Meyer has a broad-based intellectual property law practice that includes patent preparation and prosecution, IP litigation, and product clearance and legal opinions. He assists clients with various types of patent matters, including portfolio development and strategic prosecution. Vince prepares and prosecutes patent applications involving a variety of technologies, including food science, mechanical engineering, electrical devices, medical devices, and biotechnology. In addition, he assists litigation teams with responding to interrogatories and discovery requests, drafting motions, and conducting research for briefs and motions. 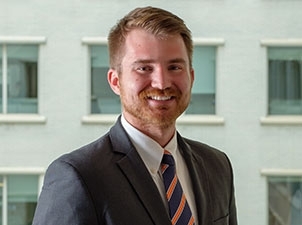 While attending the University of Illinois College of Law, Vince volunteered with the university’s IP Clinic, which enlists law students to draft patent applications for innovations originating with the College of Engineering's Technology Entrepreneur Center. As a bioengineering undergraduate, Vince gained experience in research and development during three internships. He first worked with a global medical device manufacturer, helping to design concepts and equipment for testing surgical devices. Vince subsequently did two stints as a research intern with a U.S. Air Force base where he coded software to collect and filter data from inertial measurement units and assisted in the development of sensor systems for measuring biometric data. “Sickness in Healthcare? A Cure for Alice’s Issues,” Timely Tech, illinoisjltp.com, March 2017.